At the core of Firemonkey is the idea that all components can be styled dynamically at runtime. This is what allows Firemonkey to display custom styles based on which OS they are running on. IOS can have one Firemonkey style and Android can have another. 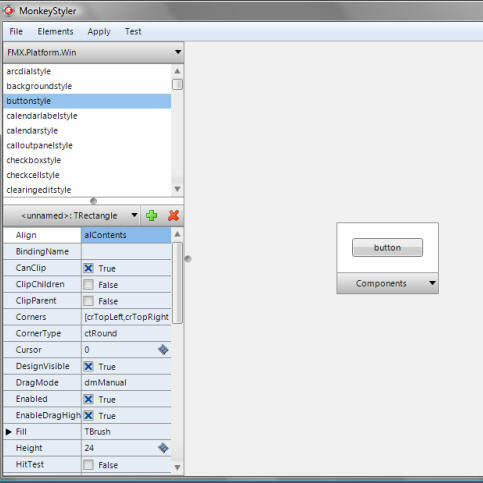 The Monkey Styler utility allows you to easily edit the Firemonkey style files and customize them how you what. It is somewhat a chore to edit the styles either using Delphi or manually but Monkey Styler makes it easy with their property and GUI based interface which will look very familiar to anyone who has used Delphi before. You can open multiple style files at the same time and copy between elements and between the different files. It is a commercial utility but probably worth it if you need to customize your mobile styles at all for IOS and Android. Especially if you use any of the TMS Software controls. Find out more about MonkeyStyler and download the free trial.